In a perfect world or when opening a new facility, this is a must read! Maddie’s Fund – Shelter Designs for Cats. This article has a link to a video and related articles if you are interested in the details of the story…Chaching! 360+ Dogs Rescued from Fighting Ring. Many of the unsuspecting citizens of San Bernardino are unaware of the horrors that have unfolded at San Bernardino City Animal shelter, Southern California, which is run with their hard earned dollars, as tax payers. The citizens of San Bernardino would shudder to learn of the animal abuse, neglect, and corruption which persists, in addition to the 74.6% euthanization rate and 37 animals euthanized on a typical day*. “We are not animal extremists, we are professionals. We are not the kind of people that throw red paint on people that wear fur. I’m really disappointed in each and every one of you for the non response to the emails. We have sat here for 4 hours listening to things like ice cream socials and chamber of commerce, but I’m here to ask you, what about the soul of San Bernardino, where is your moral and ethical compass? How can you read these emails and just be nonresponsive? I want to explain something to you. In the world of rescue, it’s no longer a local community effort, because of social media, it’s a nationwide effort. Your shelter, your slaughterhouse, is an example to thousands of people across the country of how horrible shelters are. We all wish shelters were non kill and we understand the fact that there is an overpopulation of pets, but the fact remains that there are shelters that are held to a higher standard that work with rescues to do everything possible to get these dogs adopted, and that’s simply not the case at your shelter, and you should be embarrassed. The shelter is run by lazy, complacent, and I’d even go so far as to say some of the individuals who are sociopathic. You have a crisis on your hands and I’m here to tell you that the rescue community is mobilizing, with very well established producers from LA, animal rights attorneys, investigative reporters, and people from other counties coming together to focus on your shelter; all eyes are on the shelter of San Bernardino City. Miss Sanchez, who often frequents the shelter daily, provided a dossier of evidence of instances of malpractice at the shelter. Animals are killed despite rescues notifying the shelter that they are committed to taking them. An adoptable German Shepherd / Labrador mix puppy (ID# 449816), at just 3 months old, was euthanized on July 20, despite START rescue speaking directly with shelter supervisor Ryan Long multiple times to express their commitment to rescuing this pup prior to the time of euthanization (including the previous day). Dogs are euthanized before their legal hold period has expired, for example, two pitbulls named Combat (ID#A446861) and Shakira (ID#A446862), labeled as aggressive, were euthanized on 29 May, 2 days prior to their legal hold period ending. This is despite a seemingly friendly disposition to both people and dogs captured on film by Miss Sanchez. Another example is Bronx, (ID#A450802), a 1 year old Doberman / Pinscher who was euthanized within 10 minutes of owner surrender. The owner claimed that the dog was aggressive, however, this is in contrast to this video which shows a healthy, friendly, adoptable young dog. This is believed to be an illegal act as per California Food and Agricultural code section 31754 (a); this dog was legally entitled to the full holding period. Miss Neyses witnessed 4 terrier puppies thrust into a kennel which, just 3 hours prior, housed a puppy with deadly and contagious Parvovirus. The kennel had been hosed down only, when a thorough scrubbing with bleach was warranted in order to curtail the disease. Miss Neyses also told that dogs needing veterinary attention and treatment are often neglected, for example, dogs with open wounds and flies and maggots infested, and dogs left covered in ticks. In addition, in June, puppies with Demodex Mange, an uncomfortable skin condition, were left untreated for 5 days (when application of an inexpensive cream would have helped the symptoms), despite persistent encouragement from Andrea. Lisa Michelle Corona also gave an emotional account of how the six month old puppy she adopted from San Bernardino City shelter on June 22 2013, who mysteriously went missing for 2 days whilst at the shelter, was diagnosed by a vet immediately upon leaving the shelter as having being sodomized by something “the size of a cucumber”. However the shelter records described the dog as “normal”. This case is now being investigated by Detective Luna of San Bernardino Police Department. Euthanization drugs being administered by a Vet Tech without a license for several years. The ex shelter worker who has now spoken out about what she witnessed was fired three years ago when the state licensing board was eventually contacted. At least one member of staff who allegedly actively participated in this abuse and wrongdoing, Leslie Walker, is thought to be still working at the shelter today. The shelter manager at the time, Sue Hoak, who is alleged to be aware of the aforementioned practices, retired gracefully. Our understanding is that no action was taken against the alleged offenders. This is testament to the corruption that appears to allow endless atrocities to go without consequence at San Bernardino City Animal Shelter. The Council has yet to make a commitment to add the issues raised to the agenda of a future meeting, however, during the meeting, James Penman, the City of San Bernardino Attorney, compared the shelter to “Auschwitz”. In addition, the City Manager agreed to “take a look at” the option of use of a contractor, possibly a not for profit, in overseeing the shelter, rather than the Police force which is the current arrangement. 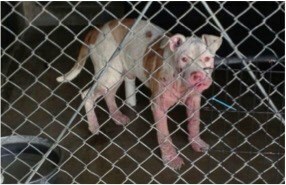 The abuse, neglect, and corruption which persists at San Bernardino City Animal Shelter must stop. The City has turned a blind eye to these inhumane, illegal and immoral practices for too long. *Source: California Local Rabies Control Activities Annual Report 2011. Please visit Shane’s War and Hope on Facebook to learn more about the incredible work being done by Shane Smith and company. #SelmaPardon #ShanesWar This is a clip of the dogs still available at the shelter. Shane’s War is currently conducting a “Pardon” to save every animal in the shelter. Off my usual topic, but how cool is this! (CNN) — When President Barack Obama presented the Medal of Honor to Staff Sgt. Ty Carter on Monday, he not only heralded Carter’s heroism on the battlefield at Combat Outpost Keating during one of the deadliest attacks in Afghanistan, he pointed out that Carter has made it his mission to destigmatize the post-traumatic stress experienced by hundreds of thousands of U.S. troops and veterans. Carter was once a skeptic of what he calls “PTS”; he does not want to add the D, saying it is not a disorder. “I didn’t believe it was real until I experienced it. I thought it was just an excuse to get out of duty or not do a job. But once it hit me and I realized it, I was blown away. How could I be so ignorant?” Carter said. YOU should take the time to watch and listen to this video. Are you a Bon Jovi Fan? YOU should listen to and watch this video. This made me think how great it would be if we had someone who could and would go to local schools and give presentations, speeches, do projects or whatever about Spay and Neuter, Feral Cats, the plight of Homeless Pets and encourage kids to do special projects and birthday stuff at AO or their local shelter. Any teachers out there with ideas on what we could do? Maddie’s Fund – Family Fun: Projects for Kids and Adults to Help Shelter Pets. It has been a long time since I read something that actually made me laugh out loud. Bob Tarte’s Kitty Cornered: How Frannie and Five Other Incorrigible Cats Seized Control of Our House and Made it Their Home did just that. There were nights when I was laughing so hard the cats would throw me a “what is your problem” look. Sometimes it was the “keep it down, I’m trying to sleep” look. For all the humor and nights of disrupting the cats with laughter, there were also plenty of profound, sentimental movements. The superb balance of humor and profound moments makes this a great book for anyone who has ever loved an animal. After all living with animals is at times hysterical, frustrating, rewarding and moving. In 2012 alone, at one shelter in California (San Bernadino City Animal Shelter), 10,000 animals were killed or died at the shelter. Please adopt from local rescue groups so we can continue to save animals from this and many, many, many other animal shelters across the state. Please spay or neuter your pets to reduce the unwanted and homeless pets in our shelters being murdered everyday. Please vaccinate the pets you do have to keep them healthy. Please stop the killing. It’s up to each of us to do our part to stop the killing. You can also foster animals from your local shelter or rescue group. You can also volunteer at your local shelter or rescue group. You can also donate to your local shelter or rescue group.